Fall is such a delicious time of year!! 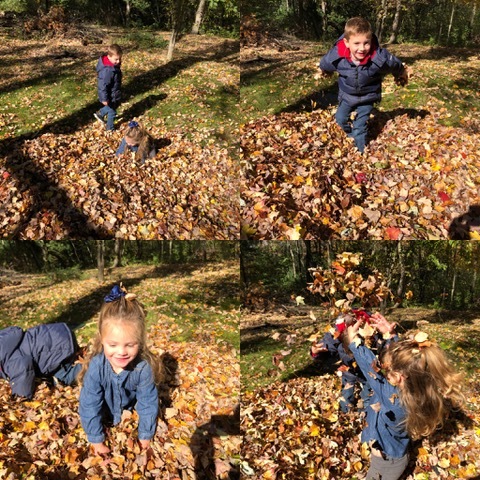 It appeals to every sense…crackling leaves underfoot, burning leaf piles, freshly picked apples, jumping in leaves, and seeing an ongoing parade of spectacular colors changing daily. What’s not to love about fall? Apple picking is one of our favorite fall activities. But first…reflections of October are in order. After returning from the California tour, which included Paul officiating the wedding of Adam and Rebecca White, we spent a scant few days at home before our next wedding event. All told we’ve been to four weddings between Oct. 7 and 28th!! That is a record. 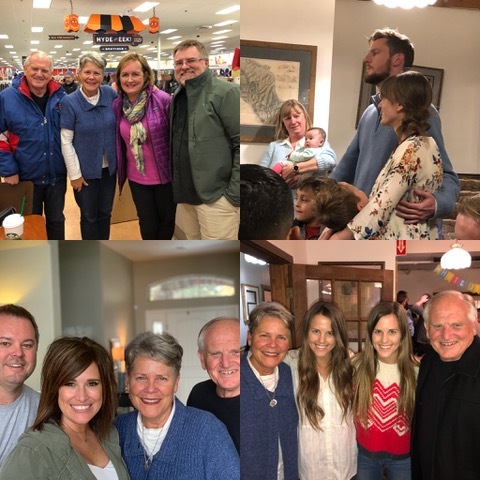 We were home only briefly between the first two weddings, but during that time, we enjoyed hosting a family of 4 from California who formerly lived in New England and were involved in the early stages of Home Improvement Ministries. Christian and Heidi Anderson and their precious 10-year-old twins Cody and Clara spent 9 days exploring New England and in between tours, they crashed at our house. 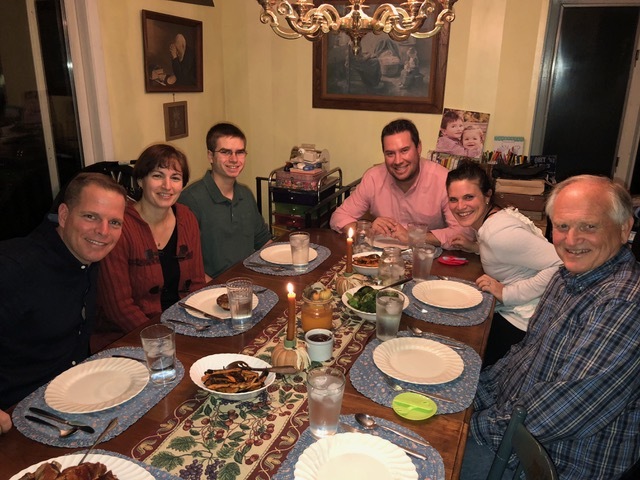 We thoroughly enjoyed the time we shared around the table, either eating or playing games, or late night debriefing after their touring was done. We also did counseling and the Patriots’ studies, and then we were off…to Colorado! We had so much fun having the Anderson family at our home for 9 days. ﻿The second wedding of the month was in Idaho Springs, Colorado, where Whitnee Sherman and Jeff Armstrong entered the covenant of marriage. Whitnee’s mom grew up at CBS in the late 70s, and Whitnee grew up at camp in the 90’s and early 2000’s and then served on staff for several summers, which is where she met Jeff, whose family has been coming to camp for over 20 years. 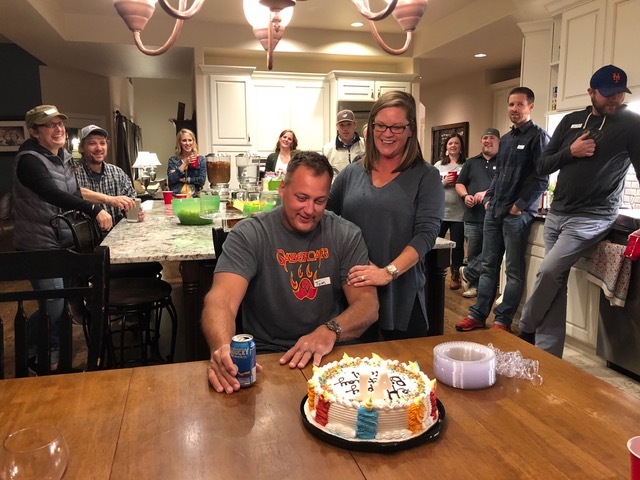 Theirs is a sweet story of God orchestrating lives and families together and their wedding was a celebration of “all that is good.” Two great families and two great “kids”—all committed to honoring God with their lives and their resources. Apparently Whitnee had always dreamed of a “Narnia-esque” wedding, and well…she got it! The first snowfall of the season happened the day before their nuptials, creating a most beautiful setting for their outdoor wedding ceremony (on a chilly 37-degree day.). The warm-blooded southern Californian pastor spoke increasingly faster as the temps dropped and before long, the “under-a-heated tent” reception was underway. Particularly moving was the “family style dining a la CBS” they chose for serving the delicious bbq meal, and nostalgia was tapped as people raised their empty dishes for refills. :) Well done, Shermans!! We were so grateful that our schedule allowed us to be there. Jeff Armstrong and Whitnee Sherman’s “Narnia” wedding in Idaho Springs, Colorado, was spectacularly beautiful. The Sherman and Armstrong families are both longtime cherished friends and CBS family campers. We were supposed to have been speaking at a conference in Tillamook, Oregon, that weekend, and with the Monday wedding, we had planned to fly from Oregon to Colorado and make a nice triangular trip. Very sadly, the Tillamook conference was postponed due to personnel issues at the church, so we were suddenly left with the weekend open. We adjusted our flight to go into Denver earlier and were able to connect with many dear friends in a short amount of time. Soon after landing Saturday noon, we met up with a couple for several hours of follow-up counseling before driving to Colorado Springs to spend some time with our niece Kristi Rottschafer Daggett and her family. From there to Castle Rock, where we spent the night with our dear friends (and former Patriots player) Tom and Julie Ashworth and had the added bonus of celebrating Tom’s birthday with a host of their friends from church. 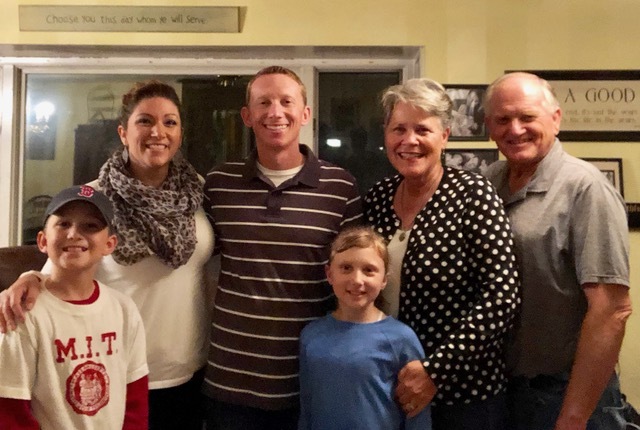 We met Gordon and Barbara Becker (who just moved from Andover to Littleton) and their kids Evelyn and Davidson at their church and had coffee with them afterwards, before heading back to Castle Rock to spend the afternoon with Danny and Rayna Oertli and Maggie and Jack. Each one of these reunions was delightful and seemed like gifts from Heaven. Our niece Kristi and her family. Tom and Julie Ashworth opened their home to us during our time in Colorado. ﻿The rehearsal dinner filled Sunday night and the wedding filled late afternoon and evening Monday, but in between we ventured on a hike to St. Mary’s Glacier (several miles out of Idaho Springs). We were handsomely rewarded with about 15 mesmerizing moments of watching two bull moose interacting. A National Geographic moment for sure!! We were over the moon as we observed “in person” moose for the first time. What a treat!! On our way to the airport Tuesday, we had the sweetest visit with Jeannie Mannes, the now 95-year-old longtime friend of CBS. Jeannie, along with her husband, Bob, spent summers at CBS during the 60’s with their 5 children directing the facility. After Bob became the dean of students at USC, they were no longer able to give up their summers but their connection with CBS never really stopped. Thankfully, we saw Bob and Jeannie in 2016; several months later, Bob passed. Our visit with Jeannie was a mix of sweet and sad as she expressed how much she misses Bob. She expressed deep gratitude for our visit. Jeannie Mannes is still sharp as a tack and we were so thankful that it worked out to visit her during our trip to Colorado. ﻿Our last stop was meeting up with Howard and Kathy Clark, who have very recently retired from lifelong ministry and relocated from California to Denver to join their children. We love the Clarks so much and are deeply grateful for the huge impact they have had on our life. Howard is arguably one of the most gifted expositional teachers of the Word and he served as a family camp speaker at CBS for over 20 years. It was wonderful to catch up with them. Howard and Kathy Clark are one of our mentoring couples and we are so grateful for their impact on our lives. Yes, we left the Patriots couples study at 8:30 pm and drove until 3 am so we’d be “ready” to speak at 10 am. Miscalculation on our part…we never quite realized the conference started on Thursday night! Thankfully, we were driving and not flying to this conference!! What a privilege to be a part of “Eusebia”! The vision of Dr. Harold Arnold and his wife, Dahlia, this second annual conference is designed to be an experience that transforms marriages—specifically, African-American marriages. The Arnolds had heard us speak at a conference 1.5 years ago and asked us then if we would consider partnering with their conference. We were honored to be in a very small minority of white couples (3 couples out of 50 couples) at the conference, and the only white speakers. We were deeply inspired by the worship and by the other plenary speakers. Besides doing two workshops and one plenary session, we met with several couples for counseling, so our time was well spent and full. We left the conference with hearts overflowing with gratitude for such a rich conference. At the “Eusebia” conference, we were privileged to partner with Harold and Dahlia Arnold. ﻿It’s always nice to get back home, but this return was extra nice because awaiting our return was the Johnson family, who had driven in from Grand Rapids, Michigan. Let the party begin!! First stop on Monday am: Dunkin Donuts!! Of course. We also managed to go apple picking, visit friends, go to the dentist (when you have the best dentist ever, you drive from Grand Rapids to keep the relationship going!! Thank you, Dr. Joseph Lee of Wellesley Dental Clinic! ), do a bit of shopping, play at the park, etc. Papa’s first outing with Nathan and Rachel was to Dunkin’ Donuts . . . of course! 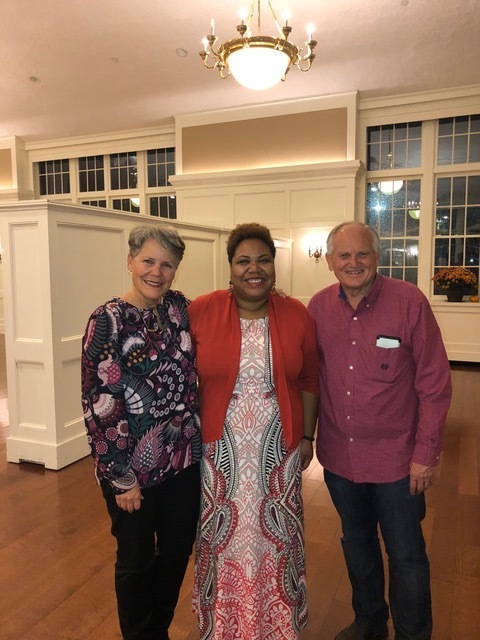 We stand with Dean Michelle Williams who hosted the evening for couples. One very fine evening with Derek and Julie, as well as Rob, Gabby, and Micah Warren. Gabby is our administrative assistant and we couldn’t be more thankful for her. The third wedding of the month happened on Friday night, on Cape Cod at Harwichport. We have been journeying with Eugene for many years, during the really difficult years of him trying to save his marriage, so the celebration of his marriage to Francis on Oct. 26th was so redemptive. The exquisitely beautiful wedding was held on the lawn overlooking the water…on a 40 degree day…so no one lingered long outside after the couple was pronounced “husband and wife.” What a joy to witness this most joyous occasion that affirmed the faithfulness of God and His redemptive work. Eugene and Francis “foreverWon” are committed to honoring the Lord through their marriage. 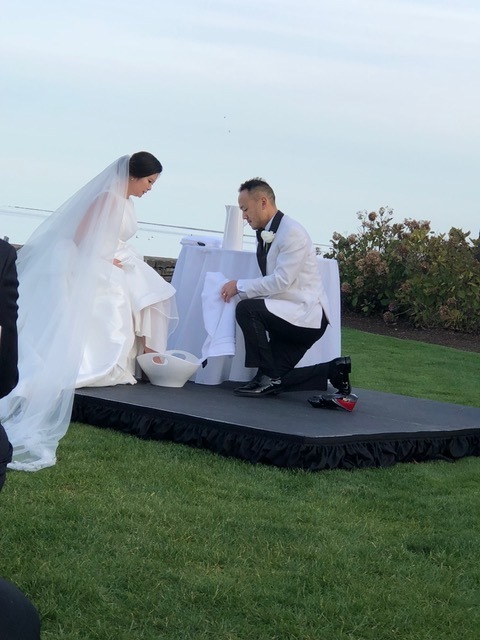 It was very moving to see them wash one another’s feet during their wedding. ﻿Saturday night, while the Red Sox were playing game 4 of the World Series in Los Angeles (and our daughter Lisa was in the stands cheering on their comeback win that night! ), we were speaking at a date night for New England Chapel (NEC), held at a restaurant in Wrentham. What a lovely job they did on this event!! Beautiful decorations and yummy food set the table for a great date night, and the sold-out crowd was very receptive to our marriage talk. We loved being with this team that is passionate about building into the marriages and families at NEC. The Family Ministries team from NEC did a great job on their date night. ﻿Very early Sunday morning, Oct. 28—and I mean VERY early—we drove ourselves to the airport to catch a flight to California for the fourth wedding. The reward for such an early reveille was our serendipitous meeting with our long time friends and mentors, Gordon and Gail MacDonald. They, too, were on an early morning flight and we had a delightful visit with them. The wedding of Nate Barr and Liz Ashoff was the reason for this quick trip. Nate “grew up” at CBS and eventually served on program staff, distinguishing himself in the top 5% of male staff we’ve had in our 40-plus-year history. Really, we have loved the whole Barr family for many years now, so being at this wedding was highly important to us. Nate has consistently been “all in” for Christ and has trusted Him to bring the right woman in to his life at the right time…and soon after meeting Liz in a continuing ed Physical Therapy class, he was pretty sure he had. Time confirmed that suspicion and they became husband and wife on Sunday, Oct. 28. Their beautiful wedding was held outdoors overlooking the Pacific Ocean in much warmer temps than we’d had Friday late afternoon at the wedding on the Cape overlooking the Atlantic Ocean. 48 hours and 3 thousand miles made quite a difference!! Nate and Liz’s wedding was also so God-honoring and Christ-centered, we felt very privileged to celebrate with them. It was also great to connect with several CBS families in attendance. Serendipitous meeting with Gordon and Gail MacDonald in the United lounge at Logan Airport at 5:30 am. Dr. and Dr. Nate and Liz Barr (both are physical therapists), ecstatic to become husband and wife! Besides the delight of celebrating with Nate and Liz, we were able to spend some days with my mom. Our original plan to return to Boston on Tuesday due to the Patriots’ studies and counseling was upended when the gal living with my mom was felled by the flu on Monday. Paul ended up returning without me and I had the joy of spending several more days hanging out with my mom before flying home on Saturday. We had a blast together, daily taking “field trips” either by car or by wheelchair. My mom is such an inspiration and I’m so grateful for every minute of time I get to be with her. By God’s grace, the flu stayed quarantined with Naomi and we had sickness-free days together. Naomi and “Grammy” sharing a moment after a Costco field trip. This weekend has been wonderfully full. We spent all day Saturday speaking at Bethany Church of Greenland, New Hampshire’s annual marriage conference. 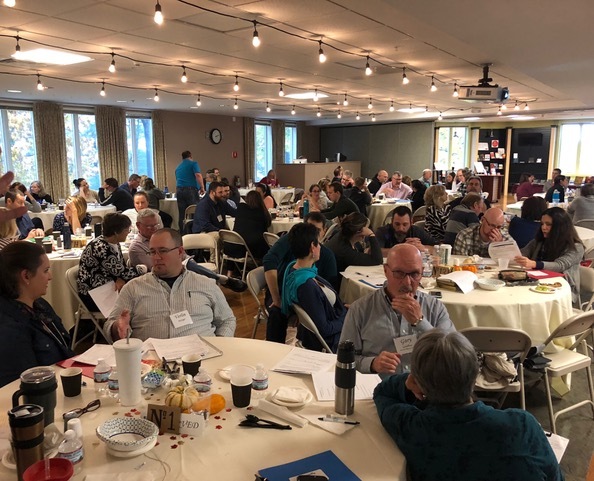 For the first time, instead of a weekend away at a hotel, they held the conference at the church and provided childcare, which drew a much larger crowd than any previous marriage conference they had held. It was a powerful day of developing the theme of “Intentional Marriage” and many commented on how glad they were to have come. We love working with this team of couples committed to building in to marriages and are so grateful to have partnered with them again. And we spent this past Sunday at Bethany Gospel Chapel (BGC) in Swansea, Massachusetts, with Paul preaching in the morning from Genesis 3, followed by an afternoon Q and A session with a multi-generational group who posed questions related to marriage and family. BGC has been a faithful partner of HIM since our beginning, not just supporting this ministry financially, but also subscribing to all of our events. We are so grateful for their support in so many ways. It was a joy to spend the day with them. Great day at Bethany Gospel Chapel, made even greater by having our friends Matt and Susie Light show up for the service with their kids. ﻿Fall is almost in our rearview mirror, and truthfully, I hate to see it end every year. But God reminded me that His beauty in creation is seen year round. 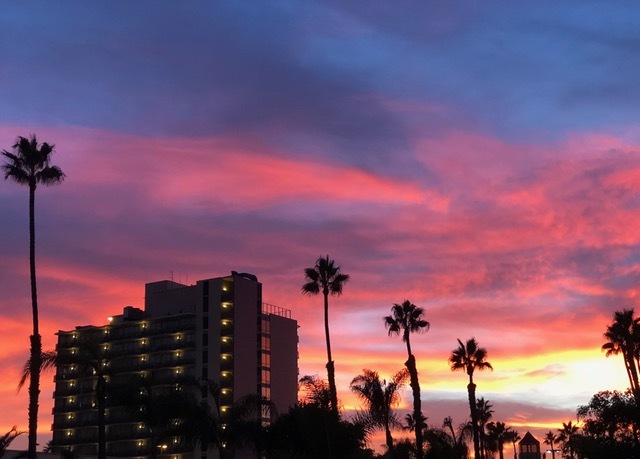 This “western sky” was His farewell sunset to me my last night in San Diego. I do love everything about fall . . . but I also love everything about sunsets.